From the series that brought you the #1 video of 2005 in Christian retail, come a fun story about sharing. The garden literally goes "nuts" when a shortage of nuts causes panic, especially with the Garden Talent Show & Tell starting tomorrow. And wouldn't you know it--everyone's talent involves a nut. With only one nut left in the entire garden, friends turn into enemies as it's a mad dash to see who grabs the last, elusive nut. To remain friends and to save the show, the bugs must learn to share. 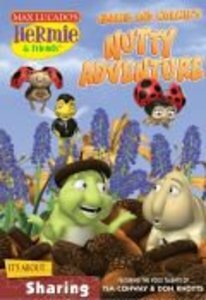 About "Nutty Adventure: To Share Or Nut to Share (Hermie And Friends Series)"